I'm all for easy and cost effective DIY solutions. Pending cases with seals still does not negate the fact that there is still a leaking/worn seal. When replacing old fluids with new and finding out you (still)have a leak or discovering that it has increased in leak rate. May indicate that they have worn to the point that even tho being a PITA is probably best to just replace the seal and continue proper maintenance from there. Especially if you have newly acquired a bike with unknown history of maintenance, or poor mainenance. dwight007fchr wrote: Changing the gear oil was on my list of many things to do to my "new" 83 GL1100 Interstate. I ran into a major "situation" when the No. 17 metric box-end wrench slipped off the excessively tight/frozen fill plug. Either it was put on way too tight, or has not been removed in so many years that maybe the threads oxidized. This soft aluminum will strip real easy. I then had to remove the side luggage support frames (another major pain) so I could get to the stripped bolt with a file to attempt to make a new size bolt. I filed and cleaned her up real good, but cant seem to find any No. 16 Metric wrenches (do they make 16s?). The 11/16 standard is too sloppy and would just shear again. Made one last attempt with a vice grip on the shoulder of the bolt, but nothing.....this bolt seems to be welded in place. So, I have drained the little amount of old gear fluid out (maybe half a cup), and am just going to use the vent plug at the top to fill her up. Although, I hope the thick goo will go into this small hole without bubbling up and overflowing due to lack of vent air during the filling. (She was bubbling up and overfilling when I was flushing out with thin oil). I will have to get the factory specs as to how much fluid it takes, and not use the fill plug as a guide. Just checked......5plus ounces or about 150cc gear fluid. Will use the Valveline 75w90 Synpower suggested by Wingman. Any other suggestions on removal of the filler plug? I just changed my final drive gear oil on my '83 GL1100. I also noticed that the filler plug hex is an oddball size....not 16mm and not 17 either. Nor any inch size fits. So...I took a thin strip of aluminum tape and wrapped it fully around the hex. Then I tried on for size the 17mm socket. Still a little too loose so one more wrap of the tape resulted in a very tight fit of the socket...just what I wanted. I put my breaker bar in socket and the plug broke loose very easily with NO damage to the hex corners. The tape is manufactured by 3M (Scotch) and measures .004" thick. Rob......Hey, that was very smart.....to wrap the bolt with tape to make a tighter fit with the 17 socket. I will have to try that next time. I was finally able to check the oil level in my final drive after struggling to get the plug loosened. Some one had over tightened it and it's made of soft metal, so was pretty chewed up by the time I finally got it out. Ordered a replacement plug from Honda, but it has a superceded number for my 1988 and when that came, it didn't fit. I discovered that a Honda CB750 tappet cover is the same part number, was available from 4into1.com , and works just fine. 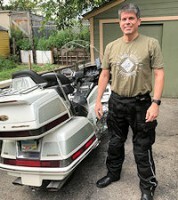 Love all the posts on this site, as they really help me out, being a recent Gold Wing owner. The aluminium fill plug hex head bolt on my gl1100 final drive has been rounded over since I have owned the bike.... I use a small pipe wrench and a cheater pipe to remove the bolt whenever I change the final drive oil every year or two... It will make the head of the bolt worse...,! But it works every time.... tighten it back up the same way... just don't over tighten it... OR you could order a new one but that's just me... If it ain't completely broke yet..? I'm not done fixing it...! wingwrench wrote: The aluminium fill plug hex head bolt on my gl1100 final drive has been rounded over since I have owned the bike.... I use a small pipe wrench and a cheater pipe to remove the bolt whenever I change the final drive oil every year or two... It will make the head of the bolt worse...,! But it works every time.... tighten it back up the same way... just don't over tighten it... OR you could order a new one but that's just me... If it ain't completely broke yet..? I'm not done fixing it...! Andy.......Yea, Im a newbie too....only a few months......and Wingman and all the others have helped immensely in the restoration of my 83 GL1100. Let me know what you find out.......as I was wondering where the grease relief was for the excess grease that goes into that grease fitting. Did you ever find an answer to the question above... Where is the grease relief for excess grease that goes into the grease fitting? I am afraid of putting to much in. Is there instructions somewhere on how to properly fill it? Also... Does the grease have to be what is specified in the manual? (lithium-based multi-purpose grease with molybdenum disulfide additive) I have a Amsoil brand lithium complex multi-purpose synthetic grease but it doesn't say it has the molybdenum disulfide additive. Is it OK to use what I have? What does the additive do? Lubricate the drive shaft joint by pumping the recommended grease through the grease fitting at the final drive gear case flange. This is the same grease they recommend to apply to the driveline splines - with good reason, because when you pump grease into this fitting, the idea is that you are lubricating the spline joint between the driveshaft and the final drive. Nowhere does it specify the amount of grease to pump, or how often. I don't believe there is a relief for excess grease - pumping more grease into it will start to fill the inside of the final drive. Eventually at some point, if you really start pumping away, it's going to come out the front of it, filling the U-joint boot and leaking out there. Being that the moly grease is really quite expensive, and that "pumping it in the general vicinity" of the driveshaft/final drive spline is what this basically does, I would be more inclined to do what is done on all the other Goldwing models - grease the splines up well with moly paste when it is disassembled, and re-treat it whenever it is removed, i.e. for tire changes. Does the grease have to be what is specified in the manual? (lithium-based multi-purpose grease with molybdenum disulfide additive) I have a Amsoil brand lithium complex multi-purpose synthetic grease but it doesn't say it has the molybdenum disulfide additive. Is it OK to use what I have? What does the additive do? OK so you're telling me not to use the grease fitting? or my Amsoil grease I have? But rather to just apply the moly paste that I used on the rear wheel / final drive? In the picture of the grease fitting, upper right corner , are those numbers helpful? Every 8000 miles according to the manual and service manual. WingAdmin ... I didn't get a confirmation from you about the grease fitting on the question above. If you are suggesting that I just use the moly paste that I used on the rear wheel/final drive where do you suggest I get it so I don't have to pay an arm and a leg from the dealer?